In my previous post, I showed you how to make Grilled flatbread pizza using a base of naan. Well here’s an easy naan bread recipe so you can make the bread yourself! 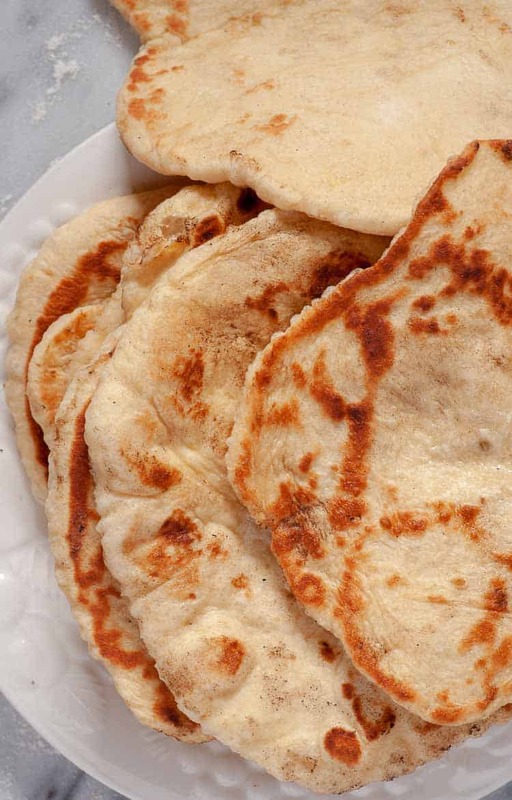 Naan brushed with melted butter makes a mouth-watering treat served warm with food or all by itself. Dry-frying in a hot pan will give the bread the traditional charring and flavor. If you’re not familiar with it, naan is a flatbread from India and the Middle East that’s traditionally baked by slapping the prepared dough from above onto the vertical walls of a cylindrical oven known as a tandoor. Here’s an interesting video showing how it’s done that way. Naan can often be hard to find in stores and it can be expensive–I’ve paid as much as $9 for 8 pieces–as well as old and stale. 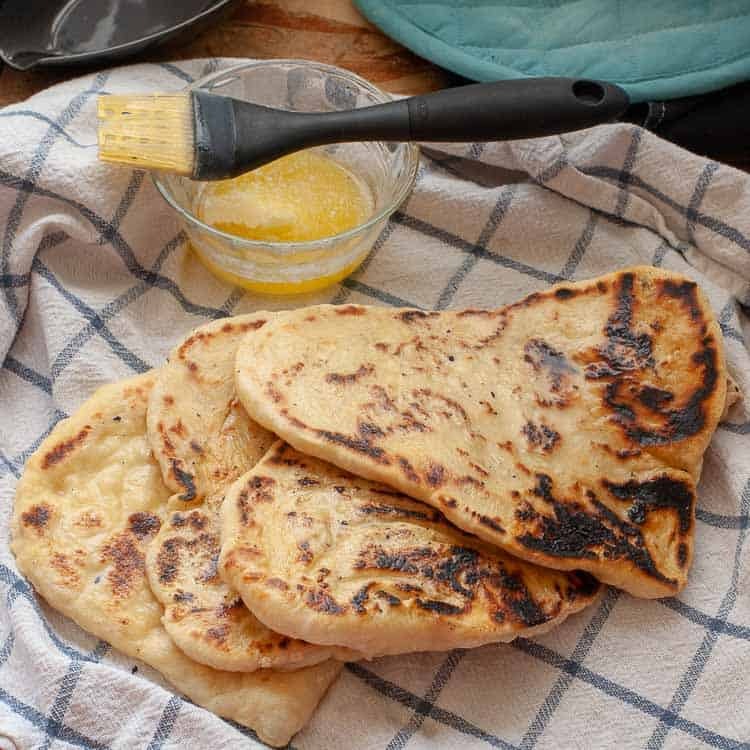 I did some research and tried other recipes, then I found this super easy naan bread recipe for fluffy, soft naan that’s fresh and inexpensive to make at home in a frying pan on your stovetop. What do I do with naan? 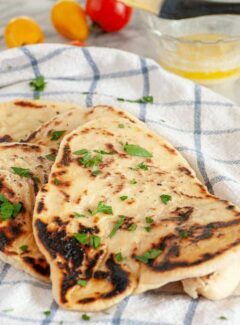 In Indian homes and restaurants, naan is used to scoop up saucy foods, but you can use it as a base for pizza, fold it around meat and cheese for tacos, spread it with garlic butter and nuke it to eat with pasta, or cut it up and top it with cheese or hummus for an easy appetizer. Or have it with tika masala, butter chicken, or saag paneer! The naan dough is mixed and can be kneaded right in the bowl (if counter space is limited) or turned out onto a floured counter for kneading. How do I make naan? The dough is simple to make by hand using a bowl and a fork. Stir together all purpose flour with a little baking powder, sugar, and salt in a large bowl, then combine active dry yeast, sugar, and warm water in a small bowl. Add the yeast mixture to the flour, along with plain regular yogurt and olive oil, then stir it all together with a fork. Some naan recipes include an egg in the dough, but when I included an egg in one trail run, we thought the finished naan tasted too much like pancakes. After mixing, turn the dough out onto a well-floured board to knead it a few minutes, place it back in the mixing bowl, and then cover with a tea towel and let it rise for a couple of hours. 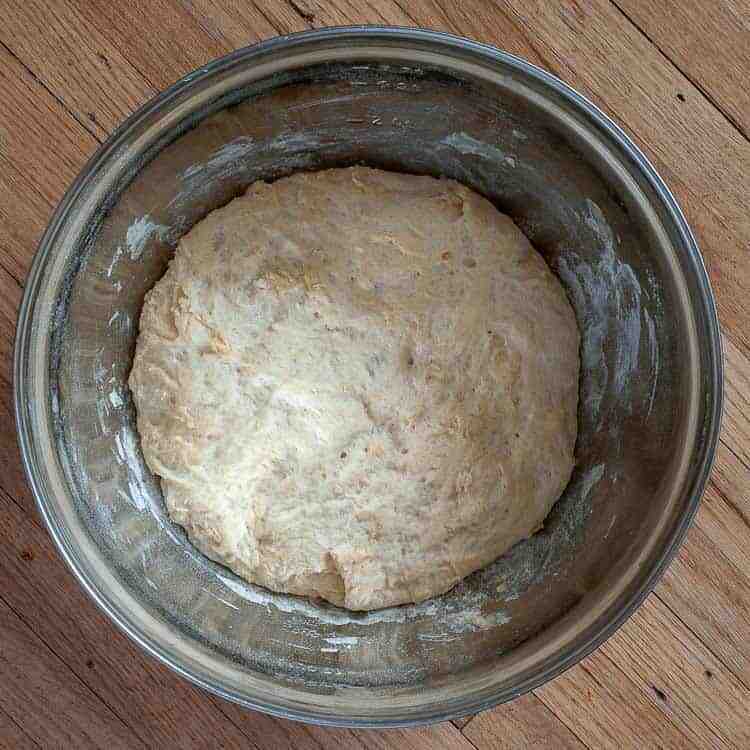 The dough was kneaded and put back into the bowl to rise. Turn the risen dough out onto the floured counter again and divide it into six pieces, then pat them out a little with your hands. 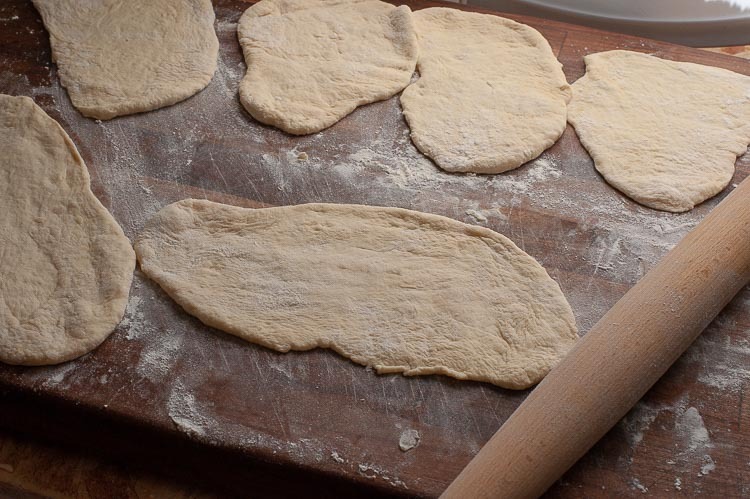 The risen dough is divided and ready to be rolled out before frying. Use a rolling pin to roll the pieces out into a sort of teardrop shape. A teardrop shape is traditional for naan, but round ones taste just as delicious. How do I fry naan? Fry the dough in a large preheated frying pan or on a flat griddle, if you have one. First, I tried frying them in a pan with a little oil. In my first test recipe, this naan was made with an egg in the dough and fried with a little oil in the pan. Most of us are used to using a little oil whenever we fry something. It makes it a little easier to flip the breads and they come out with beautiful deep golden brown spots and a soft exterior. Naan fried in a little oil comes out beautifully brown without the traditional char, but it’s still delicious. In a later batch, I just slapped the dough onto the dry preheated cast iron pan and the breads came out looking more like traditional naan with charred spots from the flour that smokes and burns in the pan. I brushed the breads with melted butter right after they were all fried. The completed naan is pillowy soft and a little chewy and a delicious accompaniment to many wonderful meals. We loved the naan using both methods of frying, so you can decide which way you want to do it. 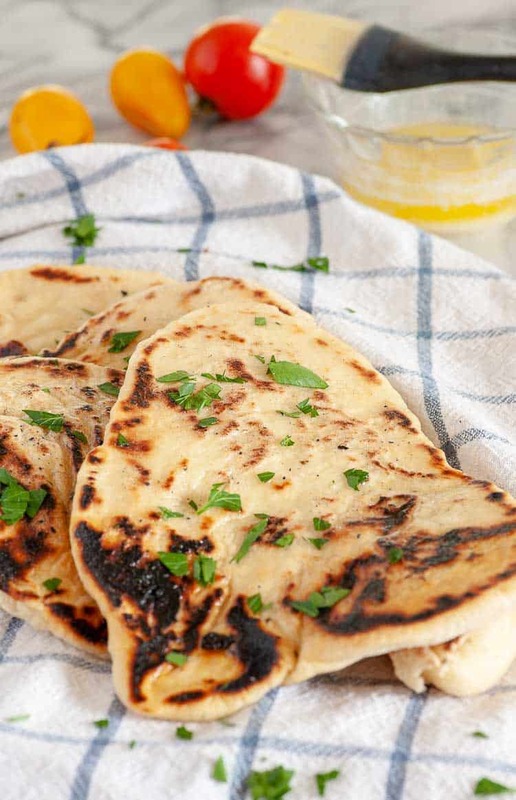 But no matter which method you choose, you’re going to love eating the results when you make this simple naan bread recipe. Very tasty and authentic recipe for easy naan bread. Combine the warm water, yeast, and 1 teaspoon of sugar in a cup or small bowl and set aside. In a large bowl, thoroughly mix the 2 cups of flour, baking powder, remaining 1 teaspoon of sugar, and salt then add the yeast mixture to it, along with the yogurt and oil and use a fork to bring it all together. The dough will be very sticky. 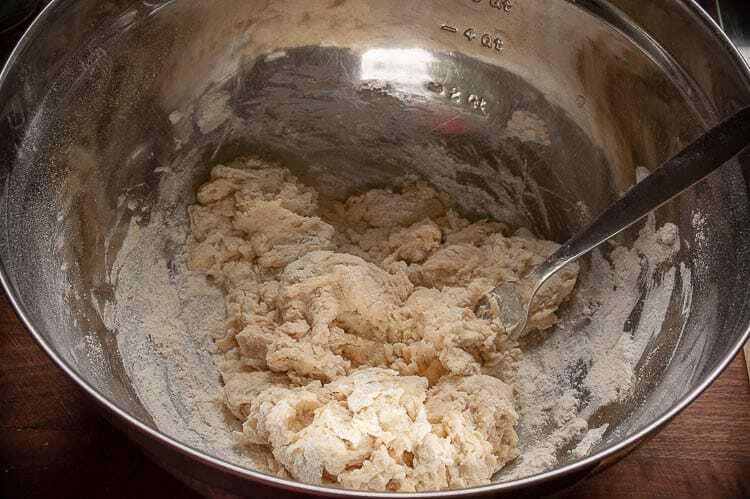 Use a bowl scraper to coax the dough out onto a well floured counter and knead it until soft and smooth, 3 to 5 minutes. Return the dough to the empty bowl, cover with a tea towel, and set aside at room temperature for 2 to 4 hours. 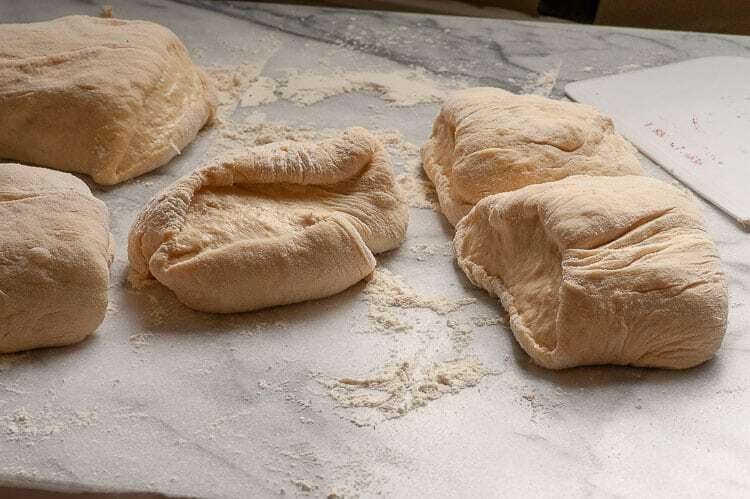 Scrape the dough out onto a floured counter and divide into six pieces. Roll each piece of dough in flour, pat it down with your hand, then use a rolling pin to evenly roll each one out into about a 7"-8" circle or tear drop shape. Heat a heavy griddle or large frying pan on high until a few drops of water immediately sizzle and evaporate. 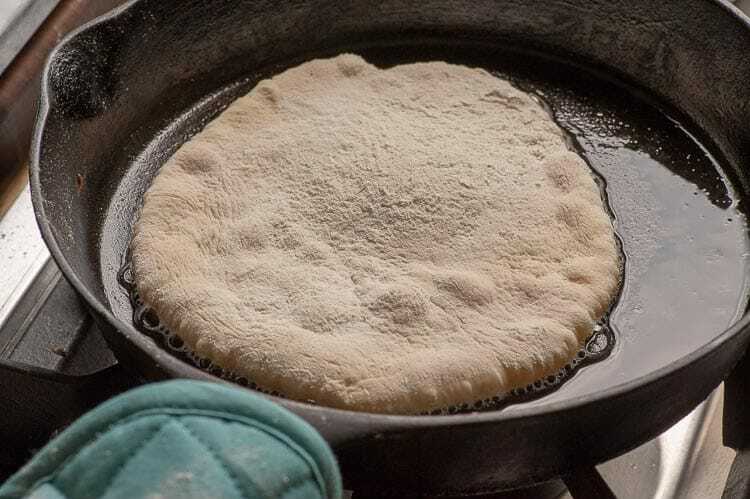 Pick up one of the rolled-out naan, stretch it out a little if it has started to shrink, then lightly dampen one side of the dough by dipping your fingers in the bowl of water and spreading a little water on the dough. Using a sort of slapping motion, place that wet side of the dough down onto the hot pan and press it down with a spatula. Fry the dough about a minute, (it will start to bubble slightly), then flip it over and fry the other side until charred, about 30 to 45 seconds. Stack the naan on a plate as you take them from the frying pan, then brush one side of the finished breads with melted butter. Serve naan warm or at room temperature. Store in a plastic bag in the refrigerate for 1 or 2 days, or double wrap and freeze for longer storage. Reheat in a microwave, oven, or skillet. Recipe from Aarti Sequeira on Food Network's Aarti Party. If you don't like dry-frying which does produce some smoke to get that traditional char, you use a teaspoon or so of canola oil in the hot frying pan before placing the dough in it. Add small amounts of additional oil as needed to fry the rest of the naan.